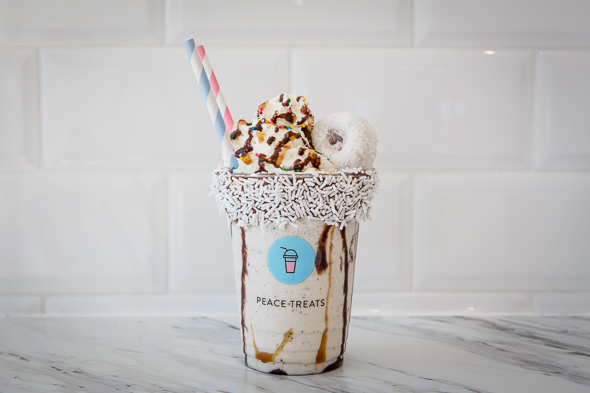 Peace Treats is a gourmet milkshake bar and more located inside Peace Collective on Ossington. 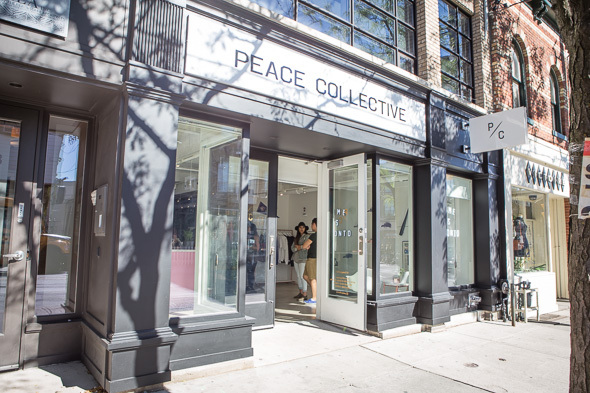 The retailer found a big space to stock their simple but innovative Peace Collective clothing line, and wanted to add something compelling, kind of like Sorry inside Kit and Ace . The clothes are all about Toronto pride, with slogans like "Home is Toronto" and "Toronto vs. Everybody" emblazoned on tees, and more generally about community leadership and support, with a portion of clothing sales going to feed hungry kids. This is the plan for the milkshake bar as well, but when we visited the team hadn't put an exact model in place for that yet. One corner of their minimalistic, stylish shop had yet to be designated space, and Peace Collective wanted to do something trendy but that no one was really doing in the area yet. Thus, Peace Treats was born. They put in a bar and some fridges, hooked up blenders, and created a white tile backsplash from which to peddle their frozen wares. They do specialty milkshakes for $8.50 as well as more basic ones for $6, and there are four options for each. 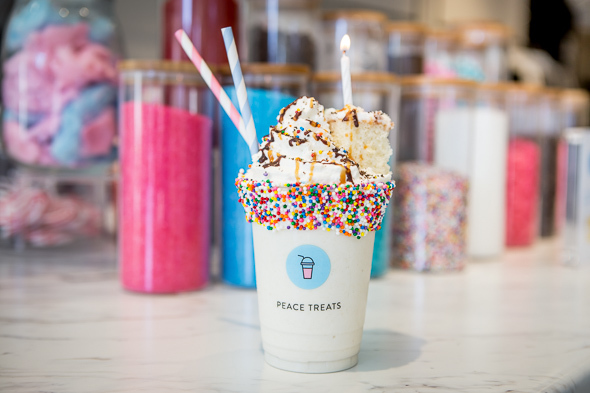 To start, we go with the cutely named "Go Shawty, It's Your Birthday": a vanilla shake with a slice of birthday cake blended right in, topped with whipped cream, chocolate syrup, caramel, rainbow sprinkles, and a little cube of birthday confetti cake with a lit candle. Our second try is the D.R.E.A.M. : that's right, DONUTS Rule Everything Around Me. It's a vanilla shake with a pinch of chocolate chips for consistency, chocolate and caramel syrup inside, whipped cream, caramel on top, chocolate sprinkles, a scoop of chocolate ice cream and two store-bought sugar donuts. Most specialty shakes come "rimmed" with frosting with sprinkles stuck to it: the Shawty has vanilla frosting with rainbow sprinkles, for example. The D.R.E.A.M. is rimmed with chocolate frosting and white sprinkles. Lastly for specialities we grab an Amusement Park, perfect for when you want the joy and calories of the CNE without being able to go to the Ex. 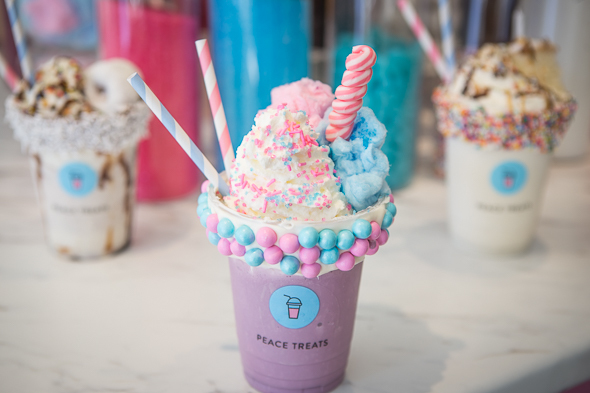 It's cotton candy ice cream topped with, of course, whipped cream, blue and pink sugar crystals, and pink sprinkles, and then garnished with clumps of blue and pink cotton candy and a cotton candy lollipop. 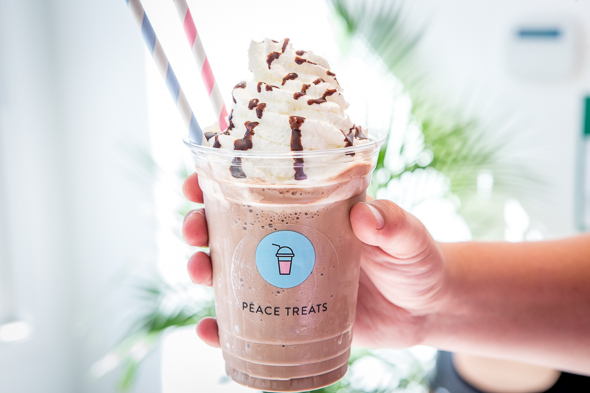 For a cheaper option there's the classic chocolate, just a chocolate shake made with great ice cream by St. Clair Ice Cream , topped with whipped cream and chocolate syrup. 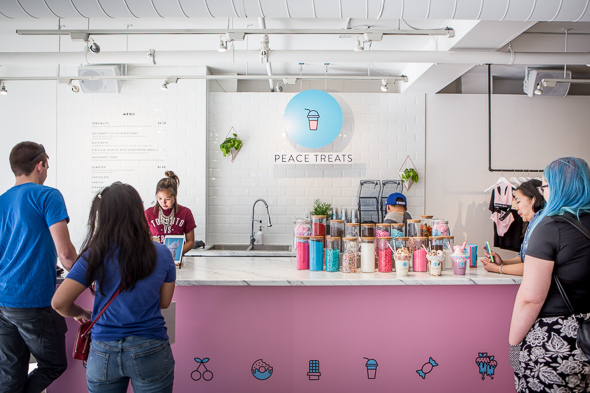 John Molina of Peace Collective spent months drafting the shakes with help from coworker Jenny La, who used to be a head of gelato at Soma .